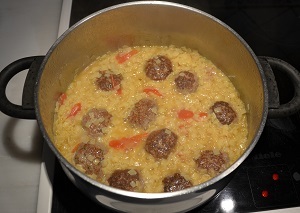 Delicious greek meat balls with Maggiri homemade pasta. A traditional recipe. A simple traditional food which is usually made with orzo, this time is made with Maggiri noodles. Make the burgers as you usually make them, and mold them into a medium size. Slightly fry them in a pan just enough to become brownish in both sides. Mince a spring onion and a tomato and saute them in a pan with olive oil. Throw the burgers in and add water until they are covered. Let them boil for 2-3 minutes and add the noodles. Add salt and pepper and stir carefully. Add some boiling water if needed. The noodles will be ready in about 2-4 minutes. Serve hot and sprinkle with grated cheese. My grandma, who is from Grevena used to make this recipe on the traditional wood stove. I will never forget the first time I went to the village and ate this food. In no time grandma lit the wood. 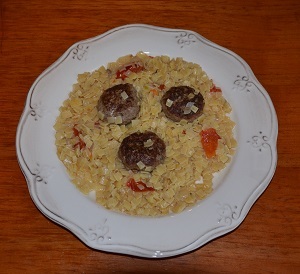 Made the burgers, cooked them for a while on the hotplate and then added the rest of the ingredients and finished the food adding orzo in a baking pan and put it in the wood stove’s oven. It’s taste was insuperable.